Toulon have said they would not release Wales prop Gethin Jenkins if they reach the French Top 14 final on 1 June. 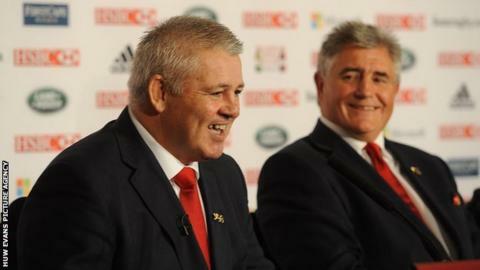 But International Rugby Board rules mean coach Warren Gatland could insist players join the Lions. And he could insist on that from five days before the 1 June Barbarians clash in Hong Kong. IRB regulation 9.6b reads: "The quadrennial British and Irish Lions Tour is a Designated Event and all Players selected to participate shall be released. "The Release Period shall ordinarily commence on 1 June and ordinarily conclude on the 2nd weekend of July in the relevant year." And rule 9.9 adds that players should be "available to train at least five clear days prior to the commencement of the international match, international tour or international tournament". Wales coach Gatland went to France on September 5, a day after his appointment as Lions head coach to talk to a number of contenders and their clubs. Gatland had already warned French-based Lions contenders that being unavailable for the tour party's departure could harm their hopes of selection. But after meeting Gatland, Toulon boss Bernard Laporte told newspaper L'Equipe: "We discussed the availability of Gethin Jenkins. "We said again that we would not release him to leave with the Lions on 27 May if we are in the [Top 14] final. He understood. I think he already knew when he came to the meeting." Toulon also said Wales' clash with Australia in Cardiff on 1 December fell outside the designated Test 'window' and Jenkins would not be available for that either. But this stance is backed up by IRB rules. An IRB spokesman said on Monday: "The respective Unions are familiar with the policy regarding player release for the British and Irish Lions as outlined within IRB Regulation 9." Only Lions contenders based in France appear to be under any threat of their clubs attempting to block them starting the tour. BBC Sport Wales understands England's leading clubs will release players after their season ends at the Aviva Premiership final on Saturday, 25 May. And those English Lions not involved in that final will be available to Gatland ahead of 27 May. Welsh, Scottish and Irish-based players will also be fully available on the same basis as their English counterparts. Jenkins and fellow potential 2013 Lions Mike Phillips (Bayonne), Jonny Wilkinson (Toulon), Luke Charteris (Perpignan) Lee Byrne (Clermont Auvergne) and James Hook (Perpignan) will battle throughout the season to win a place in France's Top 14 final. Lock Charteris has ensured his Wales availability, but has yet to confirm a similar arrangement should the Lions want him. Jenkins, 31, who joined Toulon from Cardiff Blues ahead of the 2012-13 season, has already made two Lions tours. He was in the party whitewashed 3-0 by New Zealand in 2005, then helped the Lions regain global respect in a 2-1 defeat by South Africa in 2009.